1. It should detangle and separate individual hairs such that your brush reaches the scalp and the sebum is released helping in blood circulation stimulation and in removing dirt. 2. The comb must help in creating your desired style, cut and technique. Hence, selecting the right hair comb depends on few factors: your hair texture, detangling session, hair strands volume and your hair style. However, regardless of the hair types, having combs with teeth spacing is important and the additional factors worth considering are the comb material and quality. Extra wide tooth combs: The extra wide tooth combs are suitable for all types of hair. They have generous spacing and the overall diameter and size varies. This combination of the wide tooth combs helps to detangle dry or wet hair and prevents hair breakage. The sizes of such combs are larger and can tackle toughest detangling and combing of hair than average wide tooth combs. Such combs can handle long, very long, thick, short, curly and dry hair perfectly as a shower comb. It is a must to have this extra wide tooth comb. Wide tooth combs: These combs are spaced well apart. They are suitable for all lengths and hair textures including long, straight and thick hair. It can detangle dry or wet hair. Medium tooth combs: These combs are fairly spaced together than the wide tooth combs. These combs bring the hair strands together, but are not equally as any fine tooth comb. Medium tooth combs can be used after using a wide or extra wide tooth comb, in case your hair is curly or very thick. Conversely, for fine or medium hair type, it is suitable to use a medium comb as everyday comb. Fine tooth combs: These combs have close teeth. The fine tooth combs spacing degrees vary, such that some combs have close fine teeth, while some have wide, yet are considered to be fine tooth combs. Cutting combs: Cutting combs are with half fine and half wide. The half wide is much wider in comparison to the fine half, but less than the actual wide tooth combs. This type of half wide and half fine combs bring together the hair strands to make individual sections and to keep it wide. A cutting comb is useful in cutting the hair and also in styling wet styles. Pin Tail and Tail combs: These combs are designed with fine to wide spacing between the teeth. 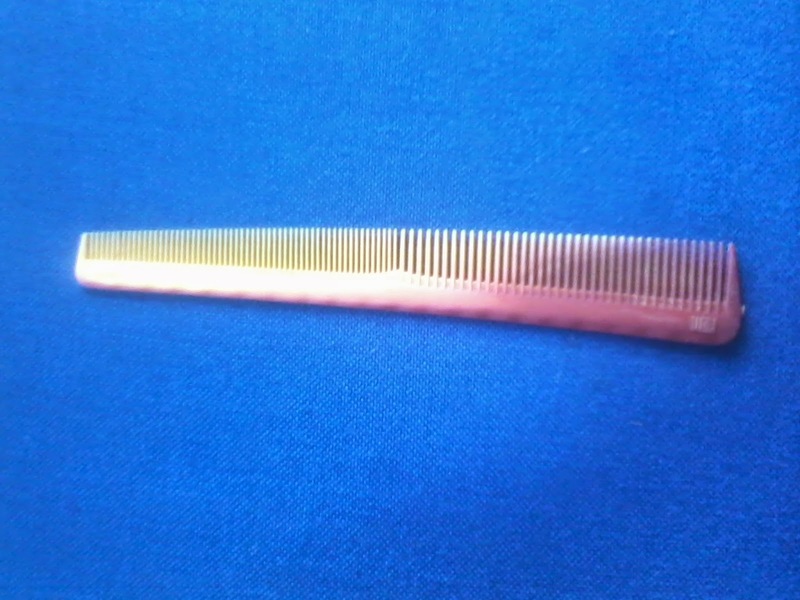 These types of combs have tails for sectioning and parting the hair. They are excellent on wet hair. The difference between pin tail and a tail comb is that the former has a metal tail. Colorgraphic combs: The colorgraphic combs is designed to style, cut and color the hair. It parts the hair and you can precisely color where you want it. Combs made of high quality thermoplastic or from a natural hard rubber offer durability, toughness and are smooth.